Comet Garradd (right) passes close by the dazzling star cluster M92 as seen from Earth on Feb. 3, 2012 in this photo taken by astronomer Conrad Jung with the Chabot Space & Science Center in Oakland, Calif.
A comet and a sparkly star cluster shined bright together this month in a space rendezvous captured by an astronomer in California. The cosmic close encounter featured the comet Garradd and bright globular star cluster M92. It was photographed by astronomer Conrad Jung with the Chabot Space & Science Center in Oakland, Calif.
Jung used a 5-inch refractor telescope to snap a 10-minute exposure of comet Garradd as it zipped close by M92 on Feb. 3. Both objects were in the constellation Hercules at the time. 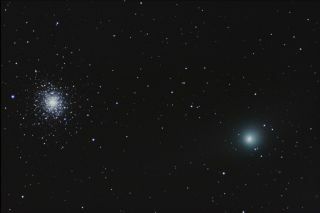 Jung's photo of comet Garrad and M92 covers an area of the sky just 1 degree across. Your closed fist held out at arm's length covers about 10 degrees of the night sky. While comet Garradd and star cluster appeared close to each other, it was only a trick of perspective. Star cluster M92 is actually about 27,000 light-years from Earth, while comet Garradd is currently zipping through our inner solar system. From Earth's vantage point, the two objects were just 0.5 degrees apart in the night sky on Feb. 3. "Comet Garradd is only a few light minutes away from Earth and travelling very fast," Chabot center officials wrote in a statement. "In the next month, Comet Garradd will be at its closest point to Earth and should be visible with binoculars or a small telescope near the cup of the Big Dipper." The comet will make its closest approach to Earth in March, when it will fly within 1.3 astronomical units of our planet, according to the skywatching website Spaceweather.com. One astronomical unit is the distance between the Earth and the sun, about 93 million miles (150 million kilometers). Comet Garradd is formally known as comet Garrad (C2009 P1) and was discovered on Aug. 13, 2009 by Australian astronomer G.J. Garradd. In November 2011, the comet provided skywatchers with a dazzling show observers with small telescopes and binoculars.